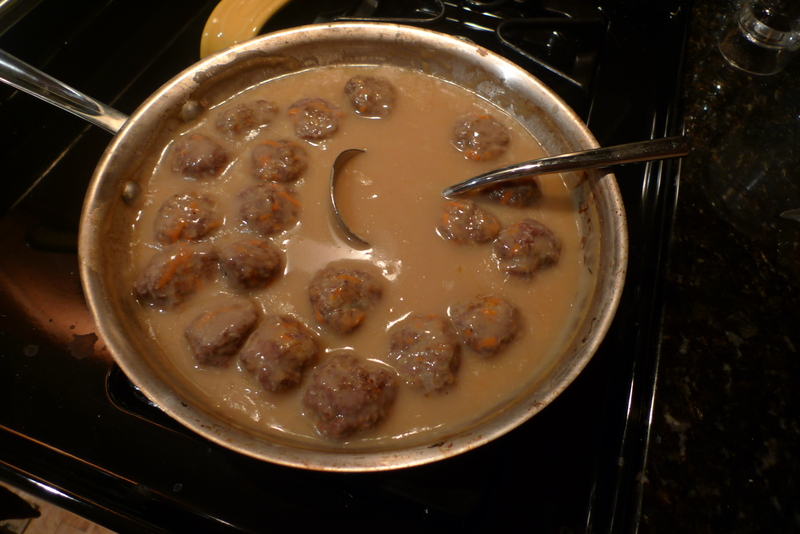 Swedish meatballs is one of those things I completely forget about until I get an intense craving and its crazy because they are so easy. I should be making them weekly, or freezing and saving them for that day I’m running around everywhere and get home at 7pm. They can be an instant dinner. I make my version with egg noodles. Traditionally I believe they are served with potatoes. 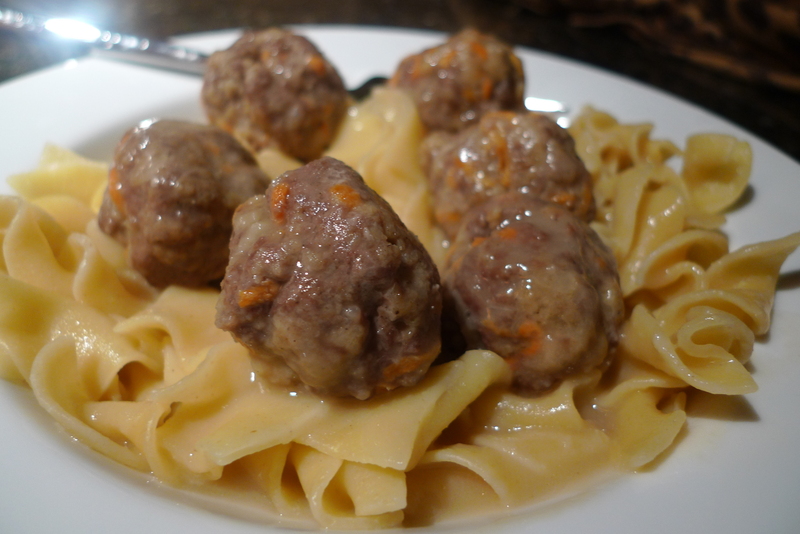 But like beef stroganoff, swedish meatballs are super tasty with wide noodles that sop up all the delicious gravy. I add soy sauce to the gravy not only to give it a richer color (I use chicken broth, which tends to make a very light gravy), but also to give it depth of flavor. Finally, I add shredded carrots – they bump up the vegetable ratio. 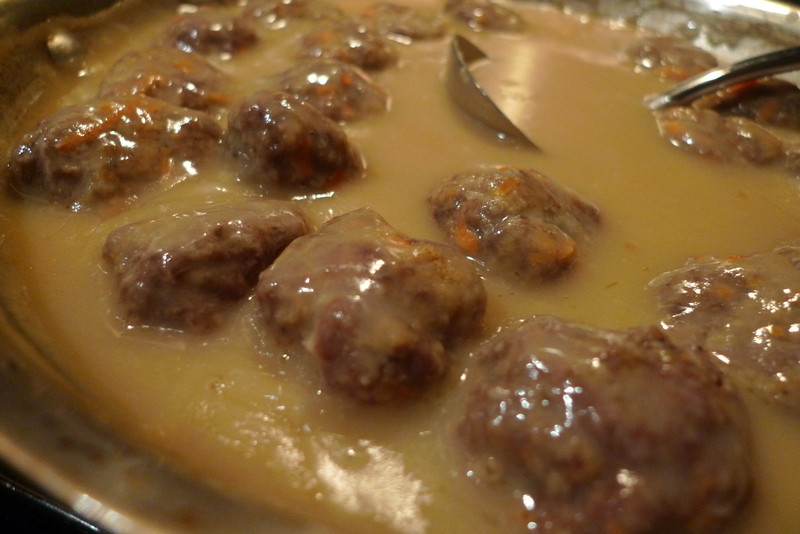 I highly recommend Swedish meatballs on a winter night after trudging through snow that leaves you feeling like a Viking. Sauté the grated onion in the butter over medium heat until it turns translucent, about 3-4 minutes. Remove the pan from heat and let cool. Preheat oven to 350 degrees. Once onions are cool, mix with breadcrumbs, egg, ground meat, carrots, salt, nutmeg, cardamom, and pepper. Use your hands to get ingredients fully mixed. Take tablespoonfuls of meat and roll into meatballs. Place on baking sheet. Drizzle olive oil over meatballs, lightly coating each one. Bake for 20 minutes or test for doneness by cutting one open. It should be brown throughout. Boil six cups water for egg noodles. Cook and drain noodles according to package directions while working on the sauce. For the sauce, heat the 5 tablespoons of butter in a large sauté pan over medium heat. Once the butter has melted, slowly whisk in the flour. It should look like a medium beige. Slowly whisk in the chicken broth, 1 cup at a time, letting the gravy thicken before adding more liquid. Continue to whisk constantly; you want a smooth and silky gravy. Turn heat to low and add sour cream. Next add meatballs. To serve, create a bed of egg noodles in each bowl. Add 4-5 meatballs and sauce to each. Meatballs and sauce can be frozen. Use a glass container so you can pop it in the microwave to defrost for several minutes until both sauce and meatballs can be removed, then place in a skillet to heat through. Thank you Frida! I will have to try making it the traditional way. I am half Swedish but my cooking heritage on that side is not very extensive. Thank you for the knowledge!